Wooden Lock Activity Box will keep your little one entertained opening and closing, locking and unlocking, storing and hiding. 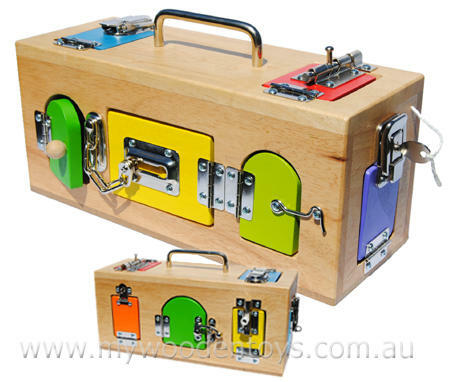 This Toy Lock Box has three compartments which can be accessed from ten coloured doors. This is a perfect activity toy for those fine motor skills and it is fun to hide things and find them through one of its doors. We like this because: "A brilliant toy, well thought out and wonderful quality."